It’s been a while since I’ve written up a blog post, but suffice to say: my life is dishcloths. I love that they’re easy to make, quick, satisfying, and useful. They make great gifts and there’s something lovely about having a nice stack of finished dishcloths sitting on my table at the end of the day. Mosaic ones have particularly been my jam, but I’m trying to branch out into some crochet options, as well. Here’s a small sample of some dishcloths you can find up in my Rav store. Between my furious crafting fest for the bazaar next Tuesday (ahhh, it’s coming up so fast! ), I’ve been sneaking time to work on an Indie Design now & then. The prizes are pretty awesome & it’s been a lot of fun scouring the patterns and picking out gifts. It’s also nice working from stash. This particular hat pattern is a fave of mine. I’m going to make another up soon, even! The pattern is called Feathery Owl Hat, and it’s up for sale on Rav, which you can find by clicking here. The infamous Outlander Cowl! I decided I wanted something simple, beginner friendly, and fast. Fast was really something I was after. This pattern fits the bill – it is very simple, works up fast – and best of all, it’s gorgeous. Squishy and drapey, the bulky yarn really shines. Great for beginners or experienced knitters, this project is a hit for holiday gifts, too. For a classic Claire style, pick a heathered grey yarn. This pattern is free, but if you’d like to support my designing habit, buy me a cup of coffee! Yarn: 200 yards of bulky weight yarn. Sample used Loops & Threads Charisma in “Forest”, 2 skeins. Notions: Optional buttons (sample used 2 but 3 would work better), sized 1 1/8” (28 mm) or larger as needed. Note: This cowl is worked flat with two strands held together to create a super soft, squishy end project. Using 2 strands at once, CO 10 stitches. If making a solid loop, use a provisional cast on for a seamless finish. Otherwise, cast on as usual. Repeat row 1 until cowl is desired length, leaving enough yarn to BO (measure 4 x the width of your piece and leave at least that much yarn – a bit extra doesn’t hurt though!). For a seamless finish with a provisional cast on, sew pieces together using Kitchener stitch. If no provisional cast on was used, seam ends together. Optionally, twist piece as it’s being sewn to make the cowl lay flat when worn longer as a scarf. To add buttons, sew along one end. No button holes are needed since the piece is gappy enough to let them slip through. Don’t knit? I make these to order in my Etsy shop in colours of your choice. Check out the listing here! People love ’em. So do I. So I designed up this cute little pumpkin chart that can be used for various crafting purposes – tapestry crochet, double knitting, stranding, etc. Do whatever you’d like with it! I’ve made a printable PDF version available on Etsy & Ravelry, as usual – there’s 3 charts in the paid version (plain pumpkin, pumpkin face, checkered divider), as well as some direction on what sort of crafts could be used with the chart – summaries, really – nothing in depth. If you’d like to check those out though, here’s the links. There’s nothing more satisfying than finishing up a test. That feeling of having finished combing the pattern for errors, and also creating something brand new. Like, never made before, right? Something the creator thought up and put down in a pattern and I got the first go at it! This blanket is one of those patterns I’m so happy to have tested – it was a really enjoyable project. The designer is great to work with & the pattern is flexible in that it can work with almost any yarn weight. I chose to do it in worsted weight because I have plenty of colour options, and the size I tested would make something along the lines of a baby blanket or a lap-ghan. My finished project ended up being about 37″ across after blocking, and turned out so cool. My mother (happy birthday mom!) suggested that she should be getting it for her birthday (and it’s likely going to head that way, since currently, it’s being monopolized by Hiro as a nap blanket – cats, they do what they want, I guess). This project was a joy to work on from start to finish – the pattern will likely be published in May, and when it is, I’ll post up a link for it! It’s written and charted, making it a really versatile & fun project to work on. I may or may not have decided on a second one already – this time in sport weight black cables and rainbow Mandala (in Gnome) for the panels. I’m so excited to start it, too! Just gotta find some time in between designing. Do you test at all? Would you be interested? I was thinking of writing a blog post about the testing process and how to get into it – we can always use more reliable testers to share the process with! Let me know! Geraldine very generously offered this pattern for free right in time for Easter crafting, and she translated it into English from her native French. The pattern is a spin on another free bunny pattern that’s floating around, but a few simple details make this one shine. What’s to love? It’s all worked in garter – knit knit knit! It’s also very beginner friendly, and you can change up the yarns used to make it a stash-buster endeavor, as well. I’ve been making up a whole army of them as gifts for my nieces & nephews this year. As you can see in my photos, they’re great little treat bags for the kiddos. One change I made was giving them fluffy little ball tails instead of pom poms. My youngest nephew is 1 (happy birthday today, kiddo!) so I wanted to make them friendly to him and pom poms aren’t great for chewing on. I used Pipsqueak yarn for the tails and crocheted them – which at first that yarn was a little over-hyped for me, but now that I’ve used it on my… six bunnies… and counting, I think I’m sold. It works great for them. These bunnies work up for me in a bit over an hour after I really got good at them, and they’re just so darn cute. 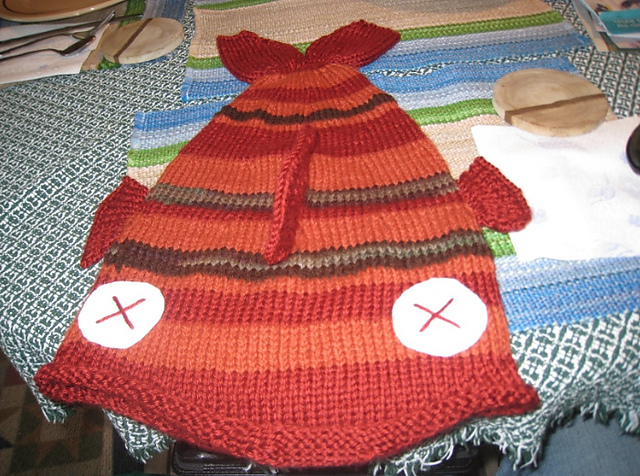 You can see more details on my project page on Ravelry, if you’d like. Don’t knit? I’m accepting orders for these little fellas in my Etsy shop until the 9th! Use coupon code “TWOBUNNIES” to get a discount when you order 2! So, are you going to make some bunnies?! Well, hop to it! Here’s a quick round up of some free pattern offers from around the web for the holidays! 1. Charmed By Ewe is offering a free pattern of your choice from their Rav store! Details can be found on this blog post! 2. Pam Daley is offering a free pattern of choice from their Rav store as well – code: MerryXmas. Here’s a link to her Ravelry store so you can pick one out! 3. This lovely knitted shawl, Dance with Dragons, is free on Ravelry until Jan. 1st, 2015. I really like the colour the sample is done in! 4. A knitted cowl, Judith’s Cowl, listed on Rav until Jan. 15, 2015. Thanks Michelle for sharing! Hello crafters! Today I was searching for inspiration on Ravelry (much to my queue’s dismay) and decided to check out the recently added patterns to the ever-growing database. I found some great quick gift ideas, and figured I’d throw together a quick spotlight for everyone to check out the awesome new free patterns available! Seven free new patterns, just recently launched! Here’s a bonus pattern, the Purl Ridge hat, free until Sept. 28, 2014! Remember: thank and praise designers, who make all these amazing things to share with us – patterns take time and work! Did you know that Friday, Sept 19 is talk like a pirate day? No, really, it’s a thing. To that end, I’ve rounded up some cute (and free!) 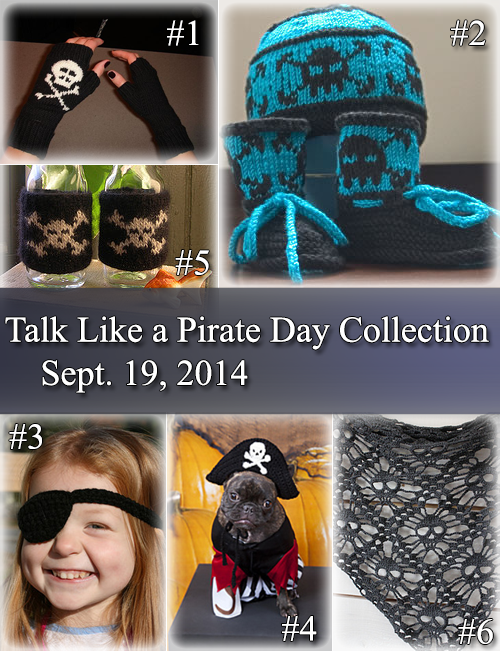 knit and crochet patterns to help you scallywags celebrate in the pillaging and plundering! Every year, I face a dilemma around holiday times: what do you craft for someone who has everything? Many people in my life fall into this category, so I’ve had to learn what ways work best for dealing with this hard to gift persons. This year, I found an excellent pattern for my grandpa for his birthday. He’s a country, small town folk sort of guy, so it was hard to think of anything practical that he’d need (crochet/knitted gloves wouldn’t suffice for his level of work.) To that end, I went with something silly instead. Enter, the dead fish hat. The dead fish hat in all its glory. What I loved about this hat was the versatility. It used up some colours I wouldn’t normally use, and allowed for me to really customize it for the person I was gifting it to. Even better, it’s actually a pretty warm hat! Grandpa ended up really liking it, so that’s a bonus too.